Regarded as one of the finest guitarists of his generation, Noam started his guitar studies at age 5 with Waldemar ong Alok followed by Dimitri van Halderen. During his teenage years he studied with Izhar Elias. Since 2010 he plays on a 2005 Thomas Humphrey Millenium. He was asked to play as a guitarist to premiere works at the Amsterdam Conseratory with contemporary compositions with a Recorder. In 2011 he commenced his studies at the Royal Academy of Brussels. Directly involved with teaching, the first year he had over sixteen students all over Belgium, some of them now succesful Classical Guitarists. 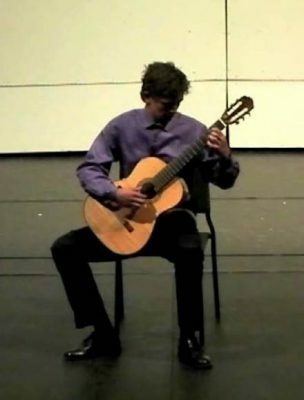 In 2012, he won the third prize in the prestigious Youth Competition of the Guitar Foundation of America in Charleston, South Carolina, presenting an Italian, Latin American, and Renaissance program. End of 2012 a live CD of ‘Trio Kanter’, with Noam’s Parents Agnes Houtsmuller and Thomas Kanter, respectively a prize winning Violinist and a Cellist, was released with music for violin, cello and guitar, with a varied program of Jewish, Italian and Argentinian original music. The program was presented in a concert series in the prestigious ‘Kasteel Duivenvoorde’. He has attended master classes by Carlo Marchione, Enno Voorhorst, Margarita Escarpa, Ricardo Gallen, Marco Smaili, Timo Korhonen and Marcin Dylla. Performances in festivals have been given in the USA, Spain, Italy, Slovenia, Germany, Belgium, and the Netherlands. A Bachelors degree of Music was attained with a great distinction, with an Exam program consisting of unknown Italian and English lute music premiered on the Classical Guitar, and Buxtehude, Spanish masters such as Fernando Sor, Enrique Granados and Joaquin Rodrigo. From 2014 to 2015 he studied in Katowice, Poland with Marcin Dylla. 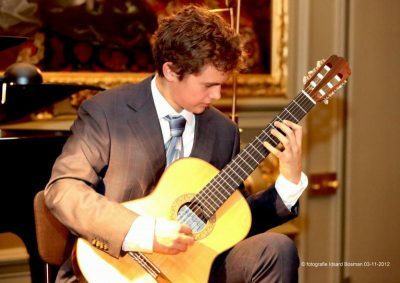 In 2015 he was awarded a Third Prize in the Alirio Diaz competition in Rome. 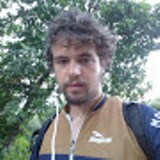 In 2016 he received his Master’s degree in the KCB in Brussels. Noam’s debut CD is scheduled to come in 2017 with works ranging from the 16th to the 21st century. In 2016 performances are scheduled throughout Holland with different programs, Solo, Trio, and with a Circus Performer Gabriele Manca.